1: Their resistivity p at room temperature, with the SI unit ohm-meter (n . m); resistivity is defined in Section 27-4.
any solid by measuring p over a range of temperatures. 3. Their number density of charge carriers n. This quantity, the number of charge Their number density of charge carriers n. This quantity, the number of charge carriers per unit volume, can be found from measurements of the Hall effect, as discussed in Section 29-4, and from other measurements. It has the SI unit inverse cubic meter (m -3).From measurements of room-temperature resistivity alone, we discover that there are some materials-we call them insulators-that for all practical purposes do not conduct electricity at all. These are materials with very high resistivity. Diamond, an excellent example, has a resistivity greater than that of coppery the enormous factor of about 1024• We can then use measurements of p, a, and n to divide most insulators, at least at low temperatures, into two major categories: metals and semiconductors. Semiconductors have a considerably greater resistivity p than metals. Semiconductors have a temperature coefficient of resistivity a that is both high and negative. 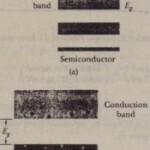 That is, the resistivity of a semiconductor decreases with temperature, whereas that of a metal increases. Semiconductors have a considerably lower number density of charge carriers n than metals. Table 42-1 shows values of these quantities for copper, our prototype metal, and silicon, our prototype semiconductor. , Now, with measurements of p, a, and n in hand, we have an experimental basis for refining our central question about the conduction, of electricity in solids.